Edelweiss Italian producer of decorative and artistic tableware, plates, dinnerware, souvenir. The production of these ceramics collections are completely hand-made as you can see on the video, their productions are on the top level quality. Edelweiss Italian factory at Nove (Vicenza) Veneto Region north east of Italy. 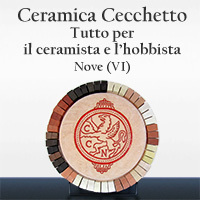 In 1975 Giuseppe Bucco and Flavio Cavalli graduate at "Istituto d'Arte per la Ceramica di Nove" and in 1977 they found Lineasette in Marostica. Initially they knead traditional ceramics for other companies and, at the same time, they start a laboratory of research and experimentation: in fact, since the beginning, there was the intention to identify new stylistic forms and new productive techniques which, on the one hand, support and enrich the productive tradition of their area, and, on the other hand, they represent the distinctive element of their artistic and handcrafted identity. Porcellain stoneware is chosen, ceramic with extraordinary physical qualities of hardness and water resistance, as a material of choice for the production of artifacts such as vases, trays, bottles, figures of men and anilmals, all studied, designed and manufactured with the artistic contribution of both. Their collections earn an ever-increasing commercial success, so that their figure of artists and artisans gradually becomes a figure of businessmen. In 1987, the laboratory moved in the large building made of steel and concrete, designed by the architect Aldo Loss, pupil of the famous Tobia Scarpa (now is the main office and the large showroom) and then, with increasing requests coming from abroad, production is relocated again, this time in a laboratory, in the industrial area of the neighboring town of Nove. Saffi Officine, ceramic art in Milan, Officine Saffi Ceramic Arts Gallery opens its new exhibition series with the first Italian solo show of the great Catalan artist Claudi Casanovas. Genius of the earth, Casanovas interacts with matter aiming to trasfigurarne epidermal characters more, until it is returned by the hardness of the rock, as if it were the primary substance of reality. It is a process that moves from a lyrical and scientific approach that could be called "molecular" through the use of sophisticated experimental methods, such as freezing in large cold storage of real clay blocks. This site is not a journal as it is updated without any periodicity. It can not therefore be considered an editorial product under Law No. 62, 7.03.2001. Some content posted on this site (text and images) are taken from the internet and thus considered to be public; if their publication violated any copyrights, please notify us via email and will be immediately removed. Before continuing to the site navigation, read the Disclaimer.